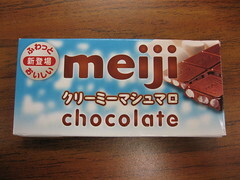 Here's a neat little bar from Meiji with some nostalgic connections. I'm sure you can guess where I'm going with this: Swiss Miss instant cocoa with mini-marshmallows, a.k.a. the best thing about playing outside in the snow. OK, so it's nowhere near as good as fancy drinking chocolate, but it sure hit the spot after an intense snowball fight or an 8 hour shift of building snow forts. These days, the last thing I want to do when it snows is go outside, but I still hit the cocoa every now and then. The mini-marshmallows in this bar added a new texture for me. I'm sure other companies have done it, but most marshmallow confections I have tried are chocolate-coated marshmallow (or sugar coated marshmallow, like Peeps, but I'd rather not discuss Peeps), which is usually too much marshmallow for my tastes. The bar smelled like basic milk chocolate, and really, the chocolate was nothing special. It was milky and sweet with a slightly sticky melt, but it didn't need to be anything more. The marshmallows were what made this bar interesting. Though I was expecting them to be freeze-dried, the marshmallows were spongy, soft, and light. They added an interesting texture to the chocolate, though not much in the way of taste. Since I've never had anything like it, this bar felt fresh and unique, and both my husband and I enjoyed it. This sounds delicious. I think I might have to try it! I hope both of you can find it and try it! Thanks for commenting. Wow this candy chocolate looks delicious, where can i find it? is there any webshop online? yum! 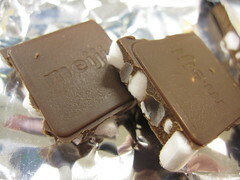 I love MARSHMALLOWS and CHOCOLATE! :) Lucky you.